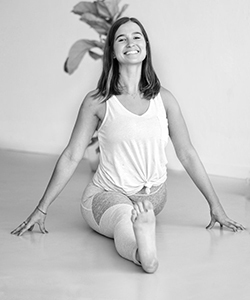 Emma completed her 200 HR teacher training at Yoga Vida in NYC, and is addicted to the teachings of Katonah Yoga. Yoga teaches us how to handle our sh*t out there in the world. My classes are creative, thoughtful and will encourage you to go up and over yourself... so you can get over yourself! When I'm not at the studio you can find me hiking, reading, watching Friends re-runs, or snuggling with my dog.